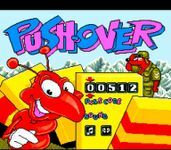 Pushover is a platform puzzle game developed by Red Rat Software in 1992 for the Amiga, Atari ST, DOS and Super NES. Ocean Software published the game. The game was sponsored by Smiths' British snack Quavers, where the game plot revolved around the Quavers mascot 'Colin Curly' losing his Quavers packets down a giant ant hill (Walkers has since bought the Quavers brand and Colin Curly is no longer used as a mascot). It is then up to the Pushover character 'G.I. Ant', a large soldier ant, to go inside the ant hill and recover the Quavers. In the SNES version of the game, the aim was to recover bundles of cash dropped down the ant hill by Captain Rat. The playing field consists of a number of platforms, interconnected by ladders. Most of the platforms hold dominoes. G.I. Ant can rearrange and move them, by carrying one domino at a time. He is allowed to push one domino, and this single push should result in all of the dominoes falling, which opens the exit to the next level. Source: Wikipedia, "Pushover (video game)," available under the CC-BY-SA License.